One of the most important and popular festivals in China is the Moon Festival. Every autumn people celebrate the bountiful harvest and the results of their hard work. 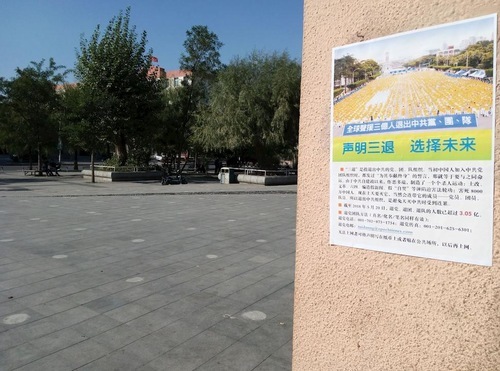 As they went about preparing for this year’s celebration, people in Tieling City noticed eye-catching posters that read, “Falun Dafa is good” and “Quit the Chinese Communist Party” everywhere. Practitioners had traveled all over the city putting up these posters to inform people about the persecution of Falun Dafa. 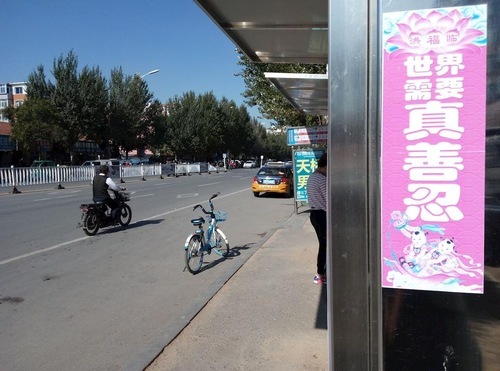 “The World Needs Truthfulness-Compassion-Forbearance” banners at a bus stop. After years of grassroots efforts to raise awareness, almost everyone in China has become familiar with what Falun Dafa is really about, contrary to the regime’s propaganda. When practitioners talk to them people often comment on how amazed they are that Falun Dafa is so well-known worldwide despite the persecution in China. 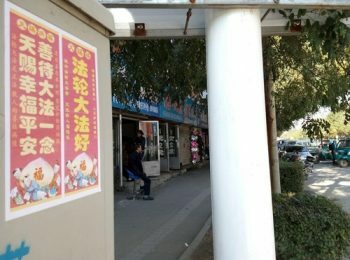 Banners urging people to quit the CCP.